For increasingly complex Apollo missions deeper into space, the family of Saturn launch vehicles would be superseded by the larger Nova rockets with a nuclear rocket stage, to support manned lunar surface exploration and, it was hoped, initial manned planetary expeditions in the 1970s. 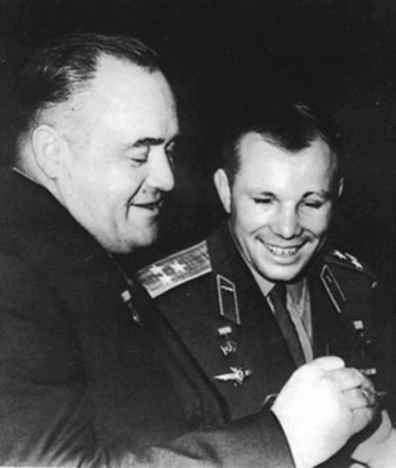 Chief designer Sergey Korolyov (left) talks with a beaming Yuri Gagarin, the first person to fly into space. 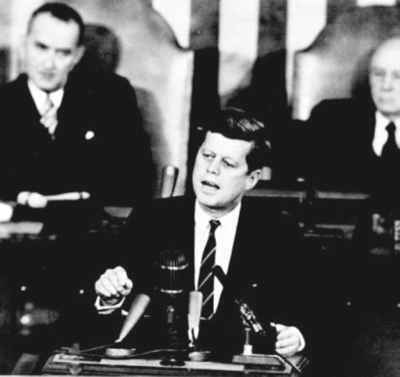 On 25 May 1961, US President John F. Kennedy delivered his Special Address to Congress on Urgent National Needs, committing the nation to a manned lunar landing by the end of the decade. Vice President Lyndon B. Johnson (left background) looks on. decade'', science was not mentioned. In a memo for the vice president (Lyndon B. Johnson) dated 20 April 1961, Kennedy asked where America stood in space and whether a laboratory in space or a manned lunar flight could be achieved before the Soviets. Less than a month later, the president made his historic, seminal speech before Congress, committing America to the Moon landing programme. The arms race that evolved into a space race had now clearly turned into a Moon race, and science on the Moon played no part in this massive undertaking. It was simply a race to get American astronauts there and back ahead of the Soviet Union, and the science would only follow once this primary goal had been achieved. 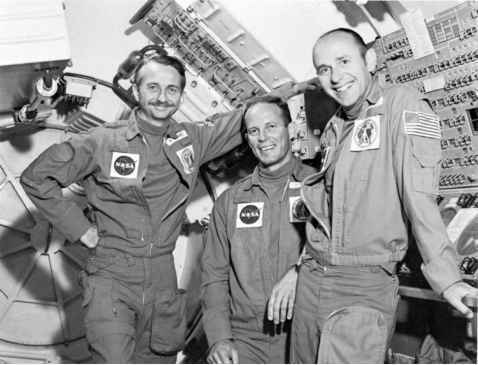 As there was still so much to develop and understand about space flight beyond Project Mercury, the ensuing Gemini and early Apollo programmes leaned more towards test programmes than scientific explorations and this was reflected in the engineer, test and jet pilot candidates of the 1962 and 1963 NASA selections. As plans for the lunar programme developed, ideas for future objectives in the civilian space programme began to emerge.14 Some of the major capabilities already existing or under development during the compilation of the Future Programs Task Group report (1964) included manned flight in Earth orbit for between one and two weeks (Gemini/Apollo Block I), manoeuvring and rendezvous (Gemini/Apollo Block II), and lunar orbit, landing and return (Apollo Block II). Additionally, NASA was looking at future applications involving Apollo-type hardware in Earth orbit for between one and two months; operations with crew in equilateral, polar and synchronised orbits; rendezvous inspection, repair and rescue; lunar mapping; and extended stays on the surface of the Moon of between three and fourteen days. All these fell under what became the Apollo Applications Program (known variously as Apollo A, Apollo X, Apollo AES, and AAP).15 In pursuit of these goals, a range of manned Earth-orbital experiments was proposed. 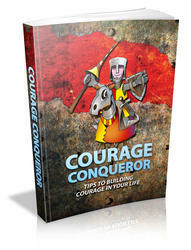 This covered such fields as biosciences, physical sciences and astronomy/astrophysics. There were also Earth-orientated applications, including atmospheric science and technology, and communications. Support for space operations included advanced technology and subsystems, operational techniques and subsystems, and biomedical and behavioural investigations. The long-term development that the agency was planning under manned space exploration programmes included conceptual take-off and landing of space vehicles (such as a reusable Space Shuttle) and flexible Earth-orbital operations. Other concepts included a large permanent space laboratory, roving lunar vehicles and the creation of research bases on the Moon, and manned planetary exploration.